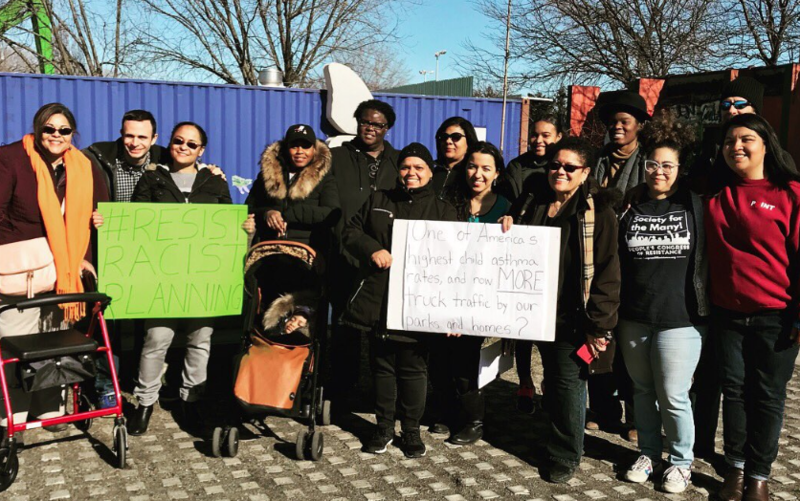 State DOT nixed neighborhood advocates' preferred plan, which would have routed trucks bound for the Hunts Point Market away from the residential part of the neighborhood. The state DOT plan calls for a highway ramp abutting the Bronx River and flying over part of Concrete Plant Park. New York State DOT wants to jam an elevated highway ramp between Hunts Point and the Bronx River waterfront. It’s exactly what South Bronx neighborhood advocates have been trying to avoid, and they’re calling on Governor Cuomo to intervene. The new highway ramp is, confusingly enough, part of the state DOT’s plans to transform the Sheridan Expressway into a surface street, which neighborhood residents campaigned for long and hard. After Cuomo announced plans to tear down the Sheridan last March, state DOT said that the project would include new ramps connecting to the Bruckner Expressway. 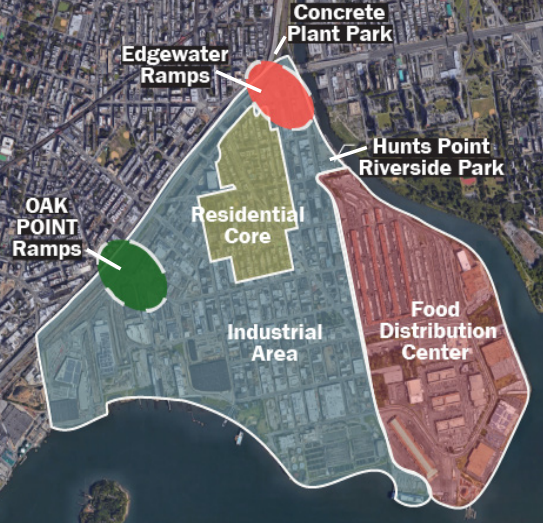 The intent of the ramps is to give trucks direct access to the Hunts Point Market food distribution center, keeping them off residential streets. But the state DOT’s preference is to build a ramp from the Bruckner-Sheridan interchange via Edgewater Road. That would put an elevated highway segment over Concrete Plant Park, with truck traffic running between the residential heart of Hunts Point and the waterfront, including Hunts Point Riverside Park. Neighborhood residents want a different, less intrusive option, with ramps at Leggett Avenue and Oak Point Avenue. State DOT studied that scenario [PDF] but rejected it in its “project scoping document” [PDF]. Now, advocates are calling on Governor Cuomo to put the neighborhood-friendly option back on the table. The main thrust of the DOT’s argument is that a ramp at Oak Point Avenue would reduce the capacity of the Oak Point rail yard, triggering opposition from CSX and Amtrak. Advocates contacted state DOT to obtain the research used to justify those conclusions, and they have not received a response. On Monday, 50 neighborhood residents gathered to protest the state DOT’s rush to move forward with the Edgewater ramp, which community groups have opposed since 2003. At the intersection of Edgewater and Lafayette, they called on Governor Cuomo to step in. Neighborhood residents are particularly concerned about the presence of large, polluting trucks along the waterfront. In addition to impeding access to Hunts Point Riverside Park, the Edgewater ramp would be an obstacle to other neighborhoods businesses and organizations along the waterfront, including the non-profit Rocking the Boat, which runs environmental science programs for young people. Why is any roadway necessary at all where the Sheridan is, just put the trucks on the Bruckner the whole way if coming from the east. And coming from the west/George Washington Bridge, they can drive down the Deegan until it changes into the Bruckner. Such unbelievable inertia, just cause the route is there now doesn’t mean it should be in the future. Oh FFS – did the State seriously reject the Oak Point ramps because of PARKING?! Is parking REALLY more important than improving safety and air quality for thousands?! This is a damn joke. If I were to guess, it’s for “easier” access to the hideous Cross-Bronx Asthmaway (which, in my view, should be deleted entirely). Bruckner to Deegan can definitely work, and the Oak Point ramps are superior for this purpose (among many others). this kills the stroad solution. When they move the Hunts Point Market to Long Island or Jersey because it’s impossible for the trucks to get access & all the jobs there are lost to the community, then will the protesters be happy with no jobs but better park access? They will move it eventually if only because the Bronx will become too expensive. So move it already, fill the vacant land with affordable housing. I’d go further – build a Cross-Bronx SUBWAY and then restore the pre-existing street grid! The jobs aren’t going anywhere; no need to shaft Bronxites for ease of highway access. If you must have it, Oak Point is clearly better. guess how we fund that subway ? by selling the lots once the pre-existing street grid is restored !